A large thermohaline cell (affected by both temperature and salinity) characterises the general circulation in the Mediterranean Sea. Circulation is driven by the water balance deficit and by the heat fluxes between the sea and the atmosphere. 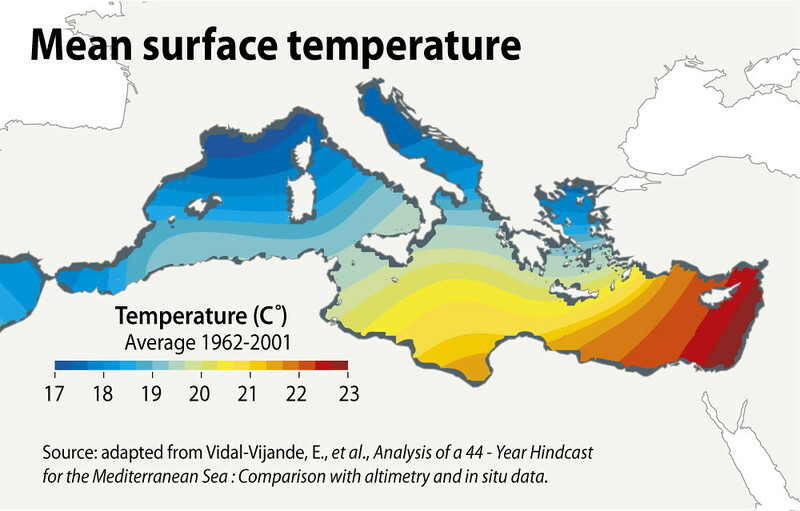 The water deficit, caused by greater evaporation than precipitation and river run-off, is mainly compensated for by the inflow of Atlantic water through the Straits of Gibraltar and by the water contribution from the Black Sea through the Straits of the Dardanelles. The exchange of heat with the atmosphere, leading to the cooling and subsequent sinking of surface waters, also contributes to the thermohaline circulation.